We’re going to dive into a couple of logic games for the next couple of posts before we come out with I think of as more “game-like” games. The problem: Variable Partition Truth Assignment. This is problem GP5 in the appendix. The description: Given a set U of variables, and a set C of clauses over U, players play a game where they alternate choosing variables from U. The variables Player 1 chooses will be set true, and the variables Player 2 chooses will be set to false. Player 1 wins if all clauses in C are satisfied. Can player 1 force a win? Player 1 can force a win by choosing x1, which will be set to true. This satisfies both clauses 1 and 3. Player 2 does not want to choose x2 or x3 (since any variable player 2 chooses will be set to false, making clause 2 true), so they’ll choose x4. Then player 1 picks either of x2 or x3 (clause 2 is still not satisfied, because the variable must be set to true by player 1), then player 2 must set the other one to false, satisfying clause 2. On move 6k+1 (so the first move of “round” k), player 1 chooses either x2n-2k or ~x2n-2k to become true. The next move, player 2 chooses the other of that pair to become false. On moves 6k+4 through 6k+6, we repeat the same sequence, but this time, player 2 can choose whether to make x2n-2k-1 or ~x2n-2k-1 false. Then we end with player 2 choosing u2n-2k-1 to become false. The hard part of the proof (and of the formula) involves all of the various ways the other player can force a win if the sequence above is not followed. Difficulty: 9. The formula in the paper is very hard to follow, which is why I didn’t go into it here- I think the important part is how it all works out. Since I couldn’t think of a way to explain it without going on for pages, I figured just explaining the idea was a better strategy. I hadn’t heard of this game before encountering this problem. It sort of feels a lot like Nim to me. The problem: Generalized Kayles. This is problem GP3 in the appendix. The description: Given a graph G=(V,E). Players take turns removing vertices and all vertices adjacent to it from the graph. The first player to have no vertices left loses. Suppose player 1 chooses vertex c. Then we also remove s,b, d, and t. All that is left are vertices a and e. Whichever vertex player 2 chooses, player 1 can choose the other one, and win. Reduction: This one is again by Schaefer, and again uses the same problem which is either Sequential Truth Assignment or QBF, depending on how you look at it. Each clause k in the formula gets a vertex x0,k. These vertices are all connected to each other. 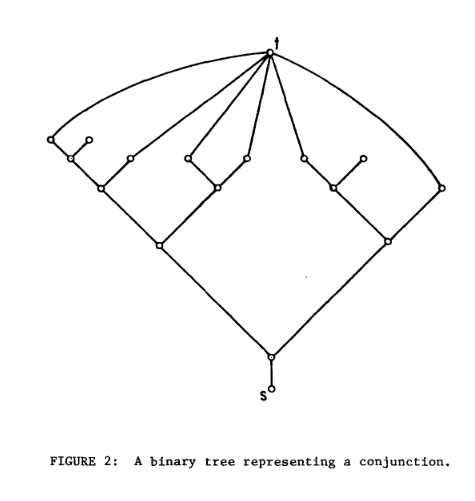 We add an edge between xi and x0,k if xi appears as a literal in clause k. Similarly, we add an edge between ~xi and x0,k if ~xi appears as a literal in clause k.
Each yi,j vertex connects to all xk vertices where k <= i. Each yi,j vertex also connects to all ya,b vertices where a < i and b < a. One main point that comes out of this construction is that players need to take their first n moves playing the x (or ~x) vertices in order. If you go out of order, the opponent can play a y vertex and remove everything. If you play a y vertex, the opponent can play an x vertex (or an x0 vertex) and remove everything. If the original formula was satisfiable, player 1 (who is the ∃ player) starts by choosing either x1 or ~x1. No matter which of x2 or ~x2 is chosen by the opponent (the ∀ player), player3 will have a way to set x3 to keep the formula satisfiable. This process continues for all variables. Once player 1 plays the last variable (xn or ~xn), all vertices have been removed from the graph- most importantly, all of the x0 vertices have been removed, because there is an edge from each one to each variable whose setting would satisfy the clause. Thus, player 2 has no place to play, and player 1 wins. If the formula is not satisfiable, then after taking turns choosing xi or ~xi for all i, there is still some x0 vertex in the graph (corresponding to a clause not satisfied by the variable choices made). Player 2 can select that vertex, removing all x0 vertices from the graph, and will win. Difficulty: 7. I can see what the “jobs” of each vertex are: The xi set the truth values of a variable, the x0 ensure that each clause is satisfied by a variable setting, and the y vertices are there to force players to choose the xi vertices in order. I don’t think I could have come up with this though. It’s spring break here- I was expecting to take the week off, but got this post done anyway. This might mean I skip next week though. The problem: Generalized Geography. This is problem GP2 in the appendix. 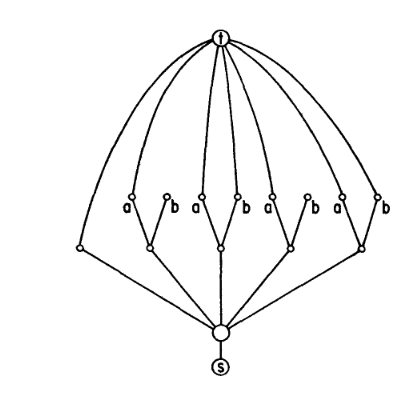 The description: Given a directed graph G=(V,A) and a starting vertex vo. Players alternate choosing edges that leave the current vertex (starting with v0. The next current vertex is the one at the end of the edge leaving from vo. You can’t choose an edge that is already chosen. The first player to be unable to choose an edge loses. Does Player 1 have a forced win? Note that the vertices can have self-loops, and (at least in the actual game) could have multiple edges between pairs of vertices. There is no requirement to have any edges leave a vertex either- I remember instituting the “Phoenix rule” on car trips because nobody could think of a place that started with X. 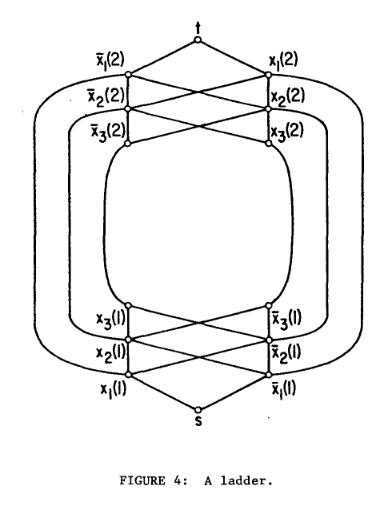 2 vertices u and v that control the “entrance” and “exit” for the setting of one of the 2 literal values. We have a vertex for each clause (yi), and an additional vertex un+1 so the last vi has someplace to go. Each set of these 4 vertices are set up in a diamond, with edges from ui to both xi and ~xi, and then from both of those to vi. vi then connects to ui+1, making a chain of diamonds. The final un+1 connects to each y vertex, and each y vertex connects to the literals that are in its clause. Player 1 starts on vertex u1. The player chooses whether to make variable x1 positive or negative by going to that vertex (simulating a “there exists”), and player 2 has no choice but to move on to the v1 vertex, and player 1 has no choice to move to the next u2 (simulating a “for all”). This alternating process continues until we hit vertex un+1. Since there are an odd number of variables, it is now player 2’s turn. If the setting of the variables has not satisfied some clause, player 2 can move to the y vertex of that unsatisfied clause. Then player 1 has to go to one of the 3 literals that appear in that clause. Since the clause was not satisfied, all of these variables have not been chosen, so the edge from that literal to the v vertex is available for player 2 to pick. But after that, the vertex from the v vertex to the next u vertex has already been chosen, so player 1 loses. If the setting of the variables has satisfied every clause, then player 2 has to pick a move to a y vertex that has a literal chosen by a player to satisfy it. When player 1 moves to that vertex, the only edge exiting that vertex has already been chosen, so player 2 loses. Difficulty: 7. I think this is very slick and elegant, but I don’t see a student getting there without lots of help. This is the first of the problems in the “Games and Puzzles” section. The way they express these problems as logical formulas are pretty neat. The problem: Generalized Hex. This is problem GP1 in the appendix. The description: Given a graph G=(V,E) and two vertices s,t in V. Players alternate coloring vertices (except for s and t) “blue” (by player 1) and “red” (by player 2). Player 1 wins if a path of blue vertices from s to t ever exists, and player 2 wins if that becomes impossible. Does Player 1 have a forced win? G&J mark this problem as “not known to be in NP” (like many of these problems), and the paper by Even and Tarjan mentions that it’s likely that this problem is even harder than NP-Complete problems, since we may not even be able to solve it in polynomial time with a non-deterministic algorithm. The hexagonal spaces are the vertices of the graph. 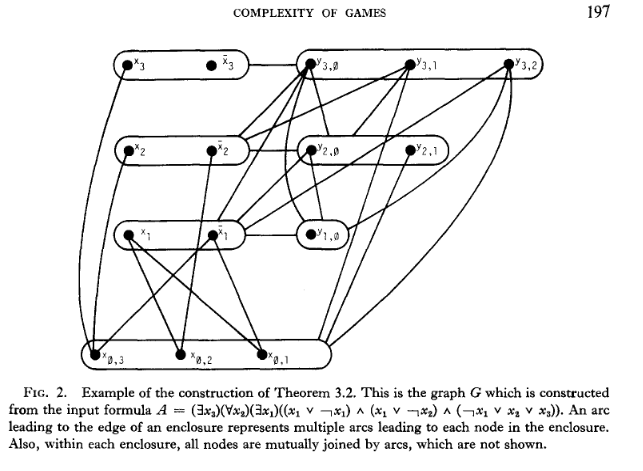 In the “standard” game, the vertices are only adjacent to their neighbors, but the generalized game allows for different kinds of connections. In the “standard” game of hex, you can connect from any hex on one blue edge of the board to any hex on the other blue edge- we can add that in the generalized game by making an edge from every cell on one blue edge to s, and another set of edges from every cell on the other side to t.
The other big difference is that in the standard game, either blue has a path connecting the 2 blue sides or red has a path connecting the 2 red sides (so blue not being able to create a path means red has a path). In the generalized game, there are no “red sides”, so all we care about is whether blue can create a path or not. If the hex marked green is blue instead of red, then blue has a forced win, no matter whose turn it is. Either of the two cells next to the left blue edge will win the game for blue. Reduction: As I alluded to last week, many of these problems reduce from QBF. So the question is: How do we take an arbitrary formula and turn it into a game board that has a forced win for player 1 if and only if the formula is solvable? It turns out that if it’s blue’s turn, blue has a forced win if and only if all of the leaves connect directly to t: Your first move is the root (above s), and then each move after that you choose the child node that is the root of a subtree that red has not played in. If there are leaves that are not connected to t, red can win by always picking a node in the subtree that is connected to t. In the graph above, if blue picks the root, red would pick the left child, forcing blue to move right. Then red picks the right child of blue’s node, and then the left child of blue’s next move. The way to think of this graph is that it is similar to “and”. 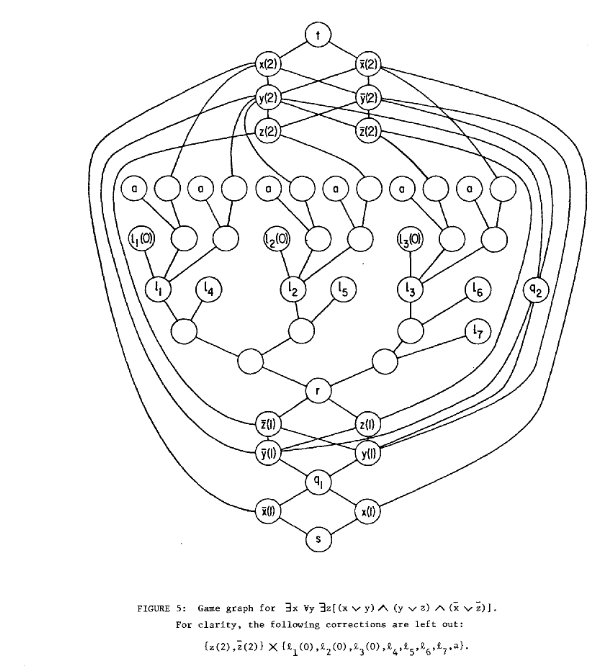 This graph has one child of the root connecting directly to t, and otherwise sets pairs of grandchildren that may or may not connect directly to t- all of the a’s connect to t, and the b’s may or may not connect to t. If it’s blue’s turn, they have a forced win if and only if there is at least one b vertex that connects to t. (Blue picks the root, red has to pick the child that connects directly to t, then blue picks the child that has both a and b connect to t, and red can’t stop it). The way to think of this graph is “or”. (The caption in the figure in the paper says this represents a “conjunction” which I’m pretty sure is a typo). There are 2 copies of each variable and their negation. If it’s blue’s move, they can pick either x1(1) or x1(2) or their negations. Then red has to pick the negated vertex of the opposite number (if blue picks x1(1) then red has to pick ~x1(2)). This will be used to force a variable to only have one truth value. If it’s red’s move, they can decide whether to use the positive or negated version of x1 and blue’s moves are forced. So, if it’s blue’s move when this ladder is reached, it works like a “there exists”- blue can choose any combination of literals they want. If it’s red’s move, this works like a “for all”- red can force blue into whatever variable configuration that they want. For each clause, we add an “and” tree, where the “b” leaves of the tree connect to the corresponding literals of the clause. The formula starts with ∃, so blue can pick either x(1) or ~x(1). The l vertices denote the subtrees. 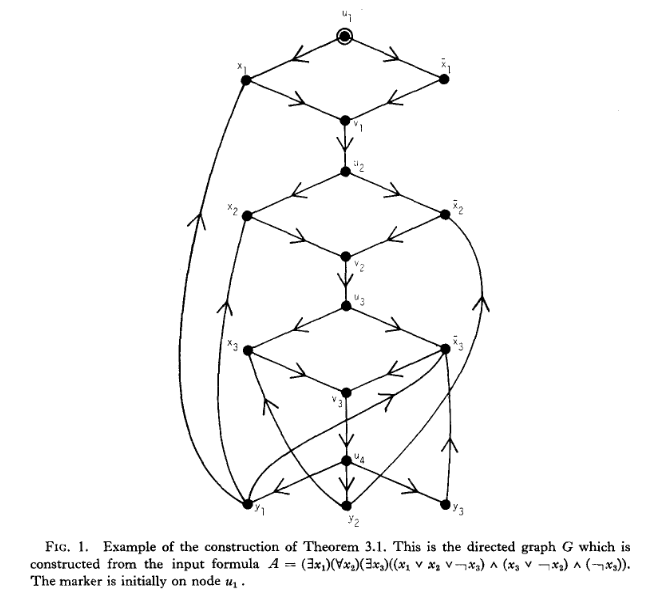 They are built out of the trees discussed earlier, and the paths through the “b” vertices (the one next to the “a” vertices) connect to the literals that are in each clause. There are a lot more details about how it all gets exactly connected, but I think this shows the main idea of how the game is set up. Difficulty: 8. This is a very cool transformation, but you need a lot of help to see the structures and forcing moves. On top of that, there are a lot of fiddly details that I’ve glossed over that are important in an actual reduction.